As we all know that when hotels describe themselves in brochures and websites they can sometimes be a little economical with the truth. I have stayed in hotels around the world that claim they are “just two minutes from the beach”. That is two minutes if you can run as fast as Usain Bolt of course. 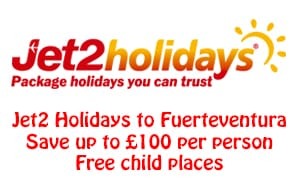 Just to save you making that mistake if you are looking for a hotel in Fuerteventura I thought I would show the top 10 Fuerteventura hotels that are ACTUALLY on the beach, not somewhere vaguely near. 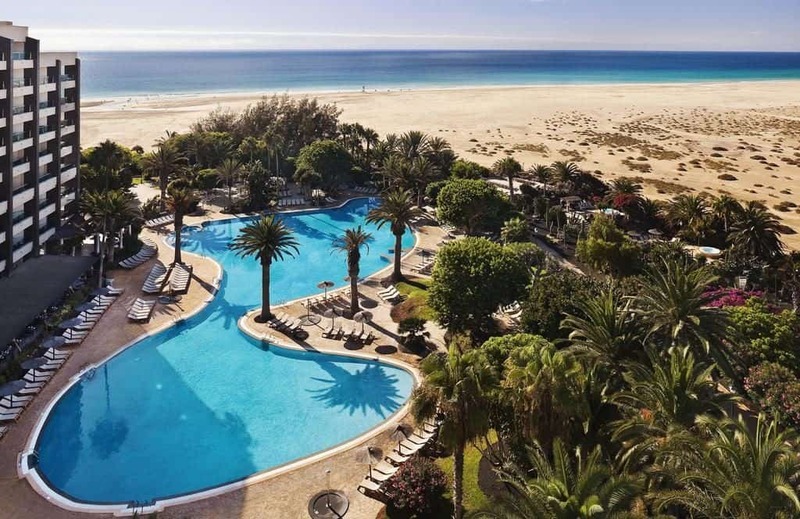 The Gran Hotel Atlantis Bahía Real is located right on the beach towards the southern end of Corralejo. The hotel has two outdoor pools located within lovely tropical gardens, There are also 6 restaurants as well as a cocktail bar and a spa. All bedrooms are fully air-conditioned and include a TV, a pillow menu, and also a minibar. Some bedrooms or suites have spectacular sea views from a private balcony or a seating area. All rooms include 1 entry to the hotel’s Bahía Vital Spa, per person per day. Fast free WiFi is available throughout the hotel, including bedrooms. The spa includes a large indoor pool, a hot tub, sauna, gym with state of the art equipment, fitness classes and a range of treatments. From the hotel you can walk for miles along the beautiful white sandy beach, all the way to the famous sand dunes and dunes beaches. You can also walk along the coastal path the other way into Corralejo town. 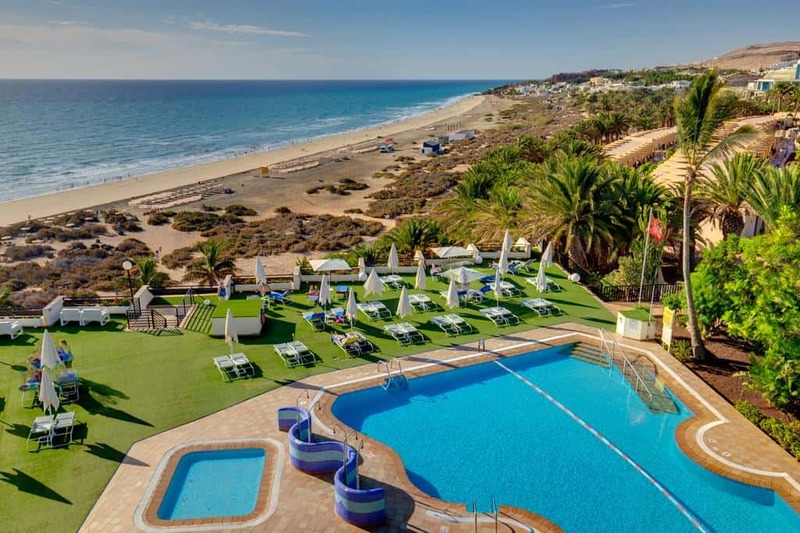 The Eurostars Las Salinas Hotel is right on the most popular of the two beaches in Caleta de Fuste. 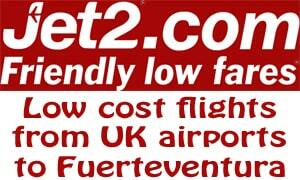 Very convenient location to walk to anywhere in Caleta. The hotel has 223 rooms either in suites or villas. Villas include a fully equipped kitchen, living room and private swimming pool. The Eurostars Las Salinas also has a great buffet restaurant, swimming pools, a tennis court and a playground for children. Guests can also use the Spa and wellness centre that includes sauna, whirlpool bath and massage service. 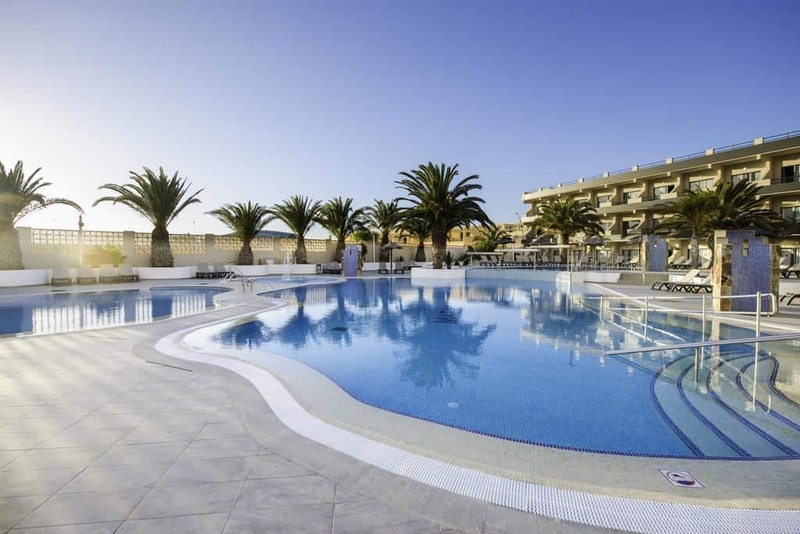 The Iberostar Palace Fuerteventura is right on the beautiful Jandia Beach and offers outdoor pools with stunning sea views. It receives very high reviews from guests. The hotel also has a Sensations Spa, including a gym, hot tub and sauna. Free high speed WiFi is available too. The spacious bedrooms at the Iberostar Palace Fuerteventura all have satellite TV and are air conditioned. They also feature a balcony with views over the gardens, pools or the sea. The El Saladar restaurant serves both traditional and international dishes. Hotel guests can also have drinks, snacks and ice cream at the pool bar. There is a piano bar and lounge bar with live entertainment in the evenings. The lovely fishing village of Morro Jable is only a 3 km walk away along the beach. Much of the beach is clothing optional for the naturists among you. 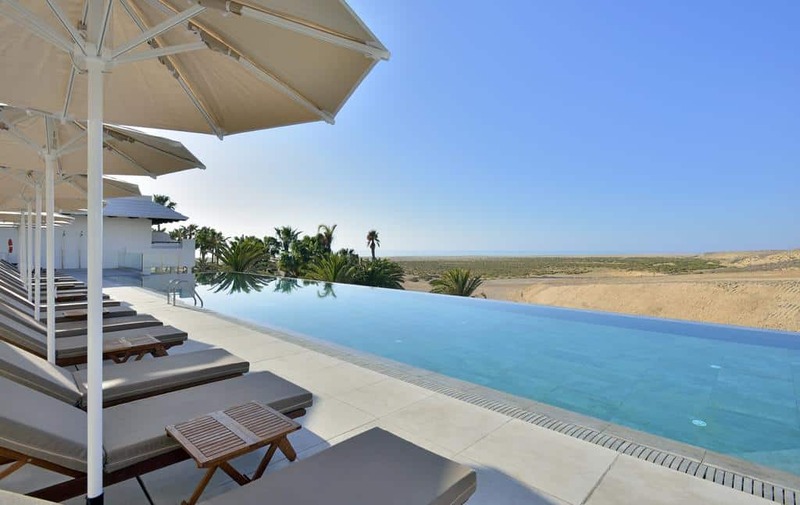 The Sol Beach House at Melià Fuerteventura is an adults only hotel set right on the beautiful Sotavento Beach in Costa Calma. It features an outdoor infinity pool overlooking the beach. The beach is clothing optional in many parts so ideal if you are a naturist. Every air-conditioned suite includes a flat-screen TV with satellite channels and a minibar. The private en-suite bathrooms have a walk-in shower and hairdryer. 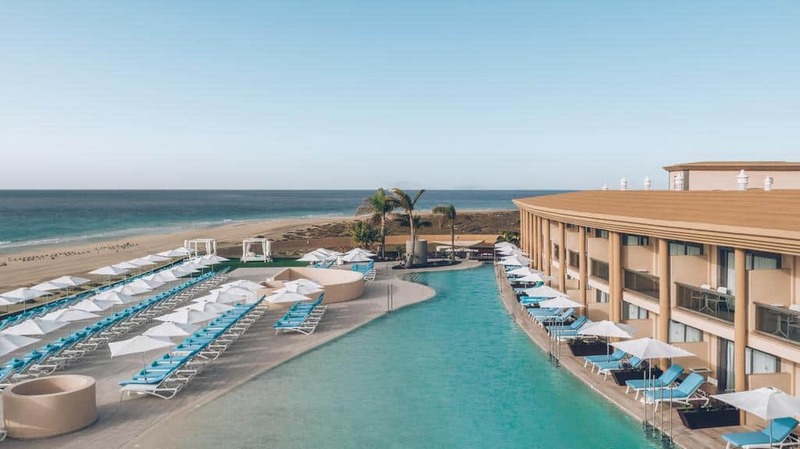 Hotel guests have access to a gym, massage cabins and an area with a range of holistic treatments available, at the next door hotel, Melia Fuerteventura. Windsurfing and kite surfing facilities can be found at the René Egli school. Guests can also take part in activities such as yoga, pilates and tai-chi. There is a buffet restaurant serving natural and organic food, as well as a poolside snack bar and a bar. Live acoustic music and DJ sessions also take place most evenings. 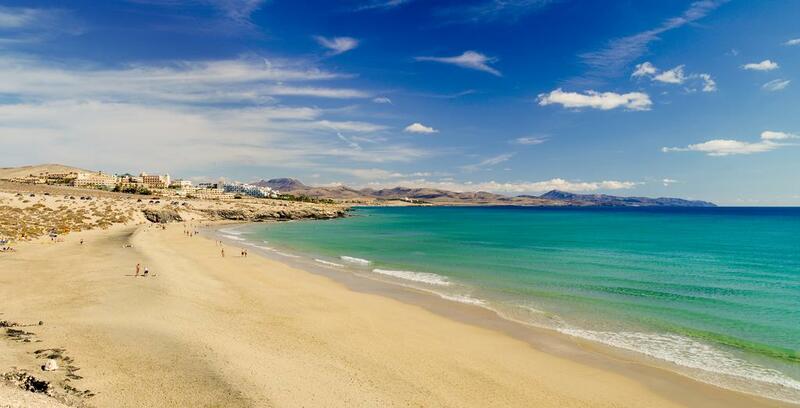 The Fuerteventura Princess Hotel is located right above the beautiful Esquinzo beach with its own private access. I enjoyed my stay there. Soak up the warm rays of sunshine, overlook the sea while dining, swing your racquet on the hotel’s own outdoor tennis court, relax in the Turkish bath or go for an early morning jog along the deserted beach – the choice is yours. Amidst a spacious tropical garden with white, low-rise buildings you’ll find 4 lovely pools (2 main pools, a children’s pool, and a naturist pool). There are three restaurants and four bars. Children can enjoy to mini club, mini disco and children’s pool. Teenagers have their own maxi club and a wifi- and playstation-corner. The Occidental Jandía Royal Level Hotel for adults only is a hotel that belongs to the Barceló Hotel Group and was previously known as the Barceló Jandia Club Premium. It is located on one of the best beaches on the Canary Islands, Jandía. This new concept of exclusive service for adults only is designed to provide maximum comfort and relaxation to guests on holiday. 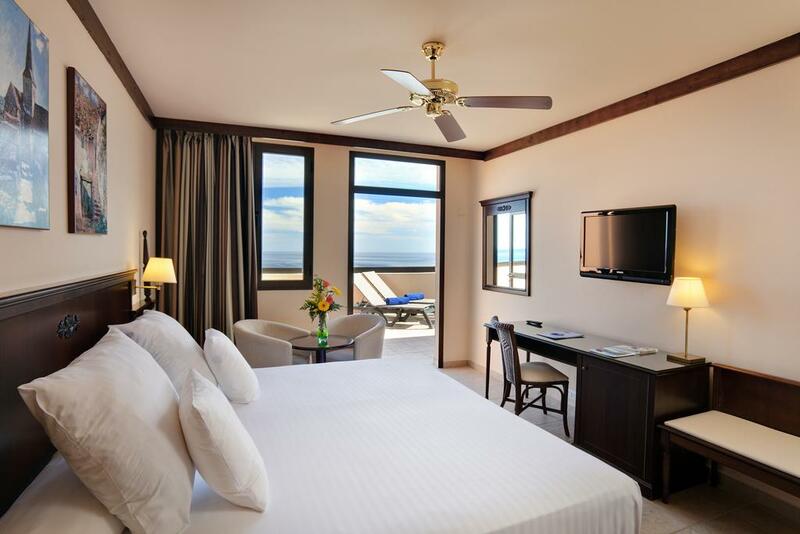 This hotel has spacious and contemporary rooms with sea or pool views. They include a flat-screen TV and private bathroom. to ensure a luxurious, intimate and relaxing stay. The Occidental Jandía Royal Level has 5 swimming pools (2 of them heated), a latest generation U-Spa and gym and exclusive food services in its Atlántico Club Restaurant. À la carte dinners can be enjoyed in the El Rincón de Jandía Restaurant. You can also choose to eat at the restaurants at the sister Occidental Jandía Playa hotel, where there are also many bars and evening entertainment. Other services available include a shuttle service to the beach, available 3 times per day. Much of the beach is clothing optional for the naturists among you. Golfers can also find one of the prettiest golf courses in Fuerteventura just 1 km away. 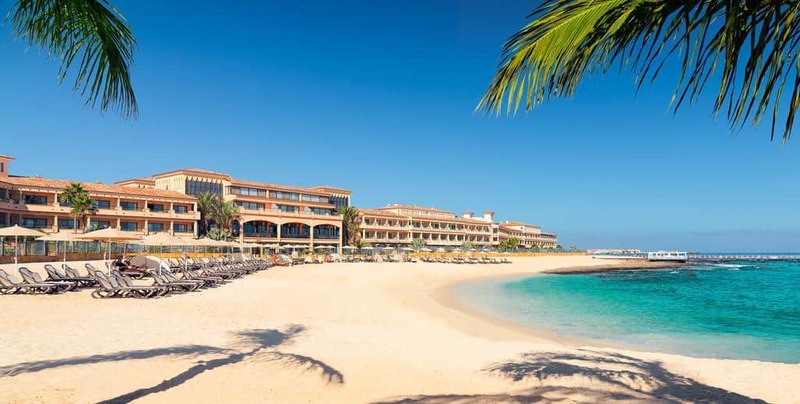 The H10 Sentido Playa Esmeralda is an adults only hotel set right on the beautiful Costa Calma sandy beach. It is an ideal place for a quiet romantic holiday for couples. This hotel includes a spa and has bright, air-conditioned bedroom accommodation with balconies. Each of the Esmeralda’s bedrooms have simple décor and tiled flooring. All rooms have satellite TV and a fully equipped bathroom. Mediterranean cuisine is provided in the Jandia buffet restaurant which is set in a lovely dining room with a terrace overlooking the ocean. Snacks are served in the Maxorata poolside bar and free Wi-Fi is available in the lobby bar. The H10’s spa has a large indoor pool, a hot tub, Turkish baths and a sauna. Treatments available also include massage and facials. The SBH Crystal Beach Hotel and Suites is an adults only hotel. It is a 4 star hotel designed for guests looking for tranquility and relaxation on holiday. 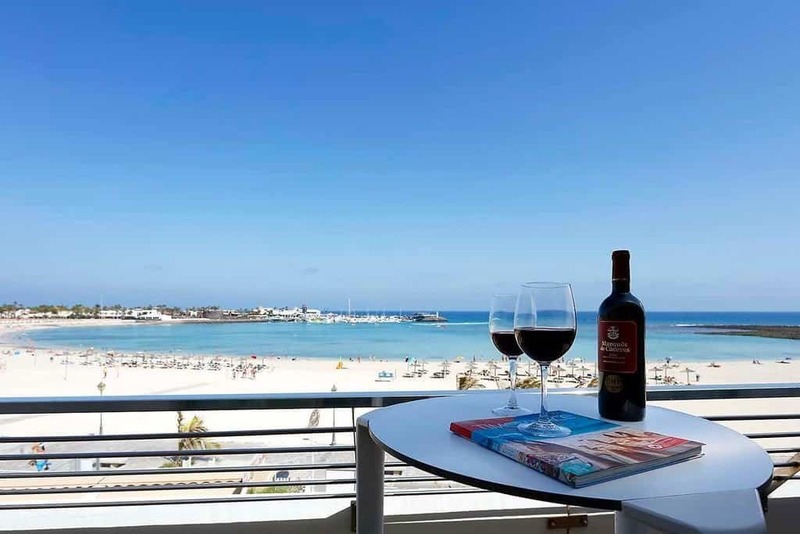 This hotel catering for the over-18s enjoys a superb setting on Costa Calma beach, one of the best beachfronts in Fuerteventura with its white sand and crystal clear waters and the ideal place to spend a dream romantic vacation. The hotel’s two restaurants offer exquisite dining at the ocean’s edge complemented by wide range of drinks in any of its bars, and a terrace featuring exceptional views towards the beach, where you can enjoy the Balinese beds – all in an exclusive and enchanting setting our guests just love! The spacious bedrooms are equipped with satellite TV and air conditioning. The Kn Hotel Matas Blancas has 2 outdoor swimming pools. 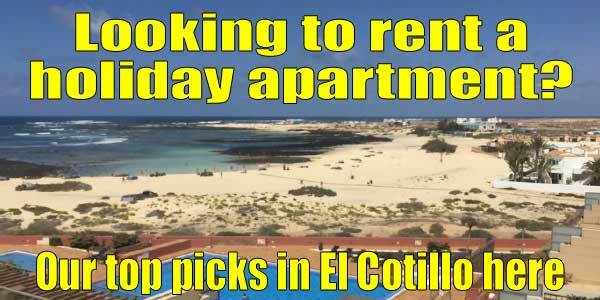 It is a hotel for adults overlooking Costa Calma beach. It offers air-conditioned rooms with balconies. All accommodation at the Matas Blancas has simple décor with tiled floors. Each room has a TV and a private bathroom with a hairdryer. Mediterranean cuisine is on offer in the Matas Blancas’ buffet restaurant. There are also 2 bars in the hotel. Sports facilities include squash courts, mini golf, paddle tennis court and table tennis. A range of shops, restaurants and bars are located only 500 m from the hotel. The hotel offers a free shuttle to the beach. 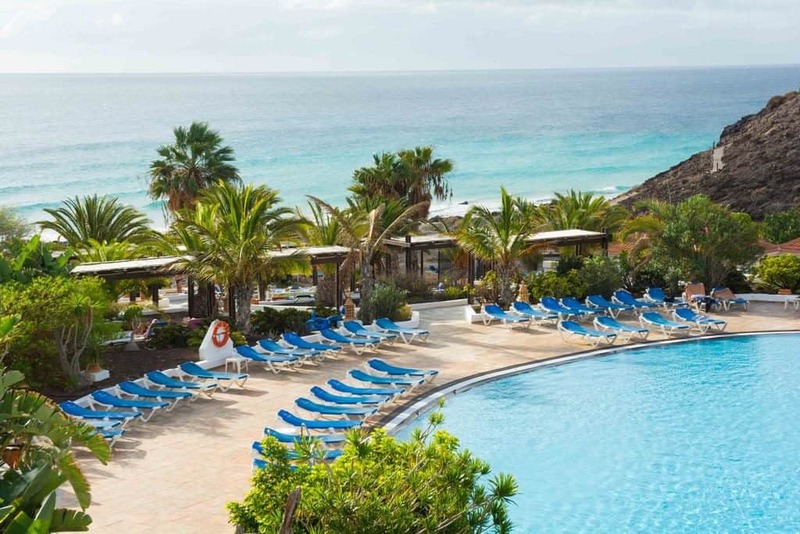 The Hotel Meliá Fuerteventura is located in the south of Fuerteventura, on the Jandia Peninsula, in a place of incomparable beauty and wildness which is listed as a protected natural area. Spectacular lagoon-style pool with 1,455 m2 of salt water, tropical pool and children’s pool. The Meliá Fuerteventura provides the exclusive The Level service and the adults-only Gabi Club with a premium gin and tonic menu. Delicious international buffets with theme areas and bars with an all inclusive option. Full activities programme, parties, musicals, evening shows and live music. René Egli, the largest windsurfing and kitesurfing school in the world, offering classes and equipment hire on the beach and the lagoon opposite the hotel.